Ran across this quote and couldn’t resist sharing it! We all know what it’s like being around people who are habitually negative. There’s a corrosive quality to their attitudes, a kind of self-fulfilling prophecy that seems to say, “No matter how bad things get, they will probably get worse!” Sadly, that kind of toxic thinking is contagious, affecting the negative person’s friends, family, even an entire office full of people. 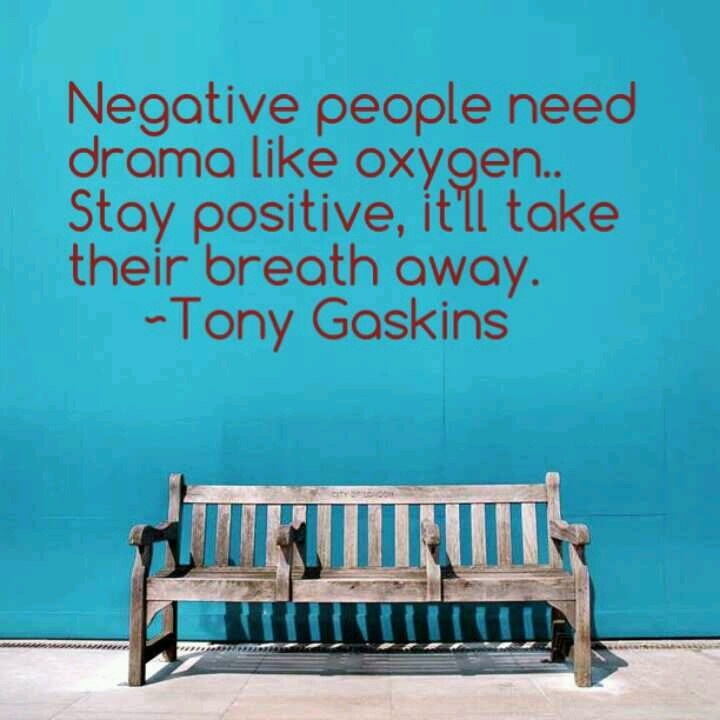 What’s more, as this little quote says, negative people tend to love drama. They wallow in conspiracy theories. They savor the direst of predictions. No positive motive goes unexamined. No good deed goes unpunished. Suspicion is the order of the day, along with a habitually thin skin. It’s exhausting! So in light of all this, what are we positive thinkers to do? Here’s the obvious answer: the best way (maybe the only way!) to overcome another person’s negativity is to find all the ways you can to stay positive. Practice the old “attitude of gratitude.” Strengthen your faith muscles through prayer and praise. Rehearse all the reasons you can find to be glad. Start hanging around people who will lift you up, not bring you down. If your circle of friends is the problem, pick new friends. Negative thinking can indeed become habitual — but then again, so can positive thinking. Easier said than done? Perhaps…but I know what the power of negative thinking can do when left unchecked and unchallenged. So choke off the drama machine! Fight back with love and a smile! It may drive your negative friends nuts — but it will be worth it.